Millions of Americans are living with chronic viral hepatitis, and most of them do not know they have it. 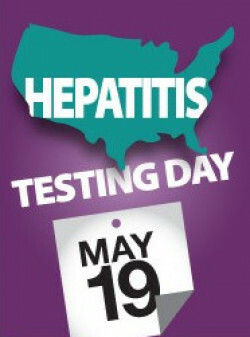 Saturday, May 19 is National Hepatitis Testing Day, an event held every year by the U.S. Centers for Disease Control and Prevention (CDC) to help raise awareness for the virus. The event is one of the main events of Hepatitis Awareness Month, held every May to remind healthcare providers and the public who should be tested and treated for HCV. Currently, more than four million Americans are thought to be living with chronic hepatitis in the United States, with up to 75 percent unaware that they are infected. Many people can live for years, and even decades with the virus without symptoms or feeling sick — but it can significantly increase the risk for cirrhosis, liver fibrosis, liver cancer and death if left untreated. This Saturday, the CDC will be hosting a Be #HepAware social media Thunderclap at 12:00pm EST. The campaign allows supporters to sign up in advance to send out a unified message simultaneously across online networks to create a wave of awareness. For more information about how to get involved on National Hepatitis Testing Day, check out the CDC’s resource center for free tools and ideas for engaging. Use hashtags #HepAware, #HepTestingDay and #hepatitis to add to the online conversation. Or, head to @cdchep on Twitter to follow the CDC’s daily updates.